This is my first Nalini Singh book. I feel like I've been saying that a lot about authors lately, but that's okay because I'm always open to trying out new writers and genres. Of course, this particular book happens to be in a genre that I absolutely love. Elena is a vampire hunter. Well, she's actually hunter-born, which not only makes her one of the strongest out there, but also one of the best. She belongs to the Guild, and is hired to bring rogue vamps to their makers when they get out of hand. However, when she's hired by an actual archangel, her life spirals into a level of turmoil she'd never have imagined. As she finds herself hunting a rogue archangel, not a vamp. In this world, archangels exist and everyone knows about it. Although they're shrouded in secrecy and like to keep a lot in the dark from the humans, they fly in and out of the Archangel Tower high in the NY skyline for the world to see. Most people get angelstruck and these angels aren't exactly kind-hearted beings looking out for humans. If anything, they seem to mostly look out for themselves. 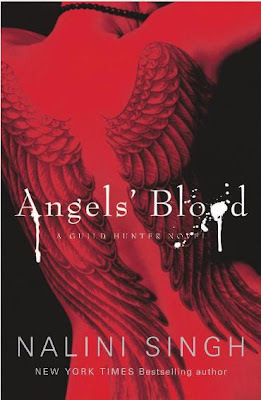 When Elena finds herself deep in their violent and unpredictable world of vamps and angels, she's forced to spend a lot of time with the Archangel of New York, Raphael. This beautiful creature is as scary and cruel as he is stunning. She can't help but feel something for him instantly, which first manifests as hatred because he has a tendency to enter her mind uninvited. Still, as things progress, they find themselves drawn to each other--a very dangerous thing for both of them. But in order to find this killer archangel, Elena is prepared to do whatever it takes, even risk her own life. I found this world very easy to get into. Everything made sense without being inundated with facts. I also found myself captivated by Elena. She's got a horrible past that remains a mystery throughout the book, but enough clues were given that the reader is able to piece together what happened to destroy her family and cause her father to disown her. Angels' Blood is an outstanding book in every way--the writing style is unique and flows in a way that kept me reading for hours and hours at a time, the characters feel real, and so interesting that you love every moment they spend on the page. The New York Nalini Singh has created is so vivid I could see angels in the skyline as a normal everyday thing, and the story so intriguing that it pretty much became a page-turner from the first word. Well, I believe I'm hooked. I loved every minute of it. And since I've got the next book in the series waiting for me, that's an awesome thing!